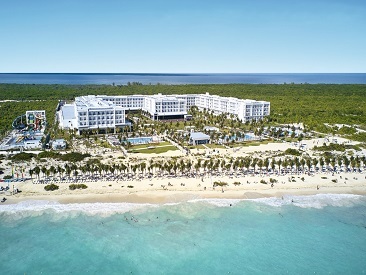 Riu Dunamar offers an unforgettable getaway to the beautiful Costa Mujeres. Boasting 740 rooms, some with marvelous ocean views, the hotel provides a variety of services, entertainment and activities. The expansive dining options help make a vacation to this hotel memorable. 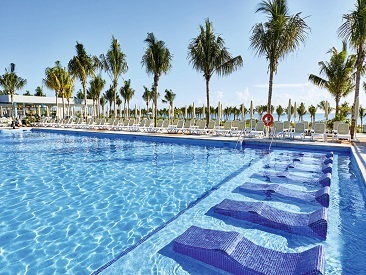 The Riu Dunamar is just miles from the bustling center of Cancun and inches from the beautiful beaches. Promising an all-inclusive, family-friendly vacation, the hotel boasts five swimming pools and a sun terrace for multiple areas to relax or enjoy activities. The beach beckons with water sports and loungers, while the pool area offers an introductory scuba lesson. Children ages 4-12 will have so much fun at the supervised children's club, and everyone will find an incredible array of entertainment choices day and night. Additional facilities include a disco, boutique and gym with both a steam and whirlpool bath. Riu Dunamar provides preferential conditions and additional value to their guests when contacting, booking and paying directly at Riviera Cancun golf course. At every Renova Spa Center, guests can now receive a $35 spa credit toward the 80-minute Renova Combination treatment. Credits are per adult guest per stay, and do not apply with other promotions or discounts. Student Groups/Spring Breakers (either groups or individuals, regardless of age) are not allowed at any time during the year.